No... not the game show, unfortunately! For my job, often times I am tasked with grocery shopping for in-store sampling events and sweep the shelves clean. Who doesn't love a free sample while grocery shopping? I'll take as many free, tasty, tidbits as I can get! So when the time rolls around - I have to shop for 5 events, each of which expect several hundred sample grubbing shoppers. I like working with food and get to select the recipe for the events, based on the time of year, seasonal products, sale items, etc. So the recipe needs to be fairly simple and easy to distribute. Just this week I went shopping for the ingredients for 70 batches (1 dozen each) of Raspberry Kisses from Kraft - which includes 15 boxes of Nilla Wafers, 37 tubs of Philly Cream Cheese & 10 jars of raspberry jam! It's always a great day when I'm able to find all of the ingredients in just one store, and just that I did this week - SUCCESS! Shopping in bulk like that is such an awkward thing to do, the looks from the cashiers and the other people in line are hilarious! And the answer is yes, you can get in front of me if you only have a few items! This week's order: 37 tubs of cream cheese, 10 jars of jam, and 15 boxes of Nilla Wafers! Another day - making pies with Cool Whip, milk & pudding! 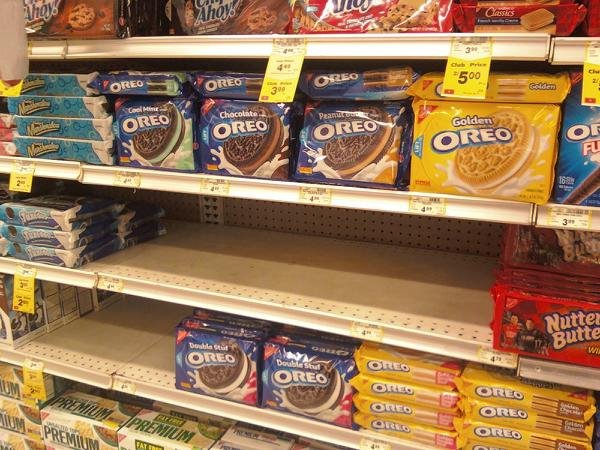 I hope nobody needs Oreos! Hi Aunt Marsha! I didn't know who Domino was at first :) The only problem is that there's no chocolate! So True but not everything has to have chocolate...just 98%!!! !